Below are descriptions of RNA’s on the Nez Perce portion of the Nez Perce – Clearwater National Forests. O’Hara Creek RNA is reached from Highway 12 by traveling south along the Selway River. It encompasses most of an entire drainage system that covers 7,000 acres with elevations ranging from 2,100 feet at the northern boundary to 6,815 feet atop Iron Mountain. The RNA is characterized by steep mountain slopes with narrow benches along major stream bottoms. It exists within the border zone of the Idaho Batholith, consisting of quartzites, schists, and gneisses. The aquatic system, the primary feature of the RNA, includes first to fifth-order streams, cascades and waterfalls, beaver ponds and wetside meadows. Anadromous fish populations are present. Both lower and upper forest zones are represented by Douglas fir, grand fir, Western redcedar, and subalpine fir. Coastal Disjunct species of plants are present and rare species include Synthris, giant horsetail, and clubmoss. Six fern species grow on the stream terraces. 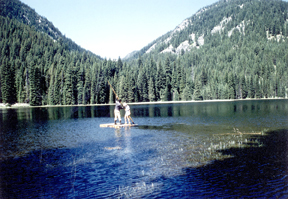 Fish Lake RNA is a 754 acre low-elevation, shallow waterbody in the Buffalo Hump area of the Gospel – Hump Wilderness. Alluvial deposits adjacent to the relatively large flat lake shores have accumulated around Fish Lake due to the gentle topography. Soils are deep and relatively stable, supporting dense amounts of sedges, rushes, grasses, and forbs. The productive moraine lake is 29 acres and contains a long shoreline with extensive wetland growth. It has four inlets and one outlet with high-quality spawning gravels present. Rainbow and brook trout exist in the lake. Moose are plentiful foraging the lake bottom. 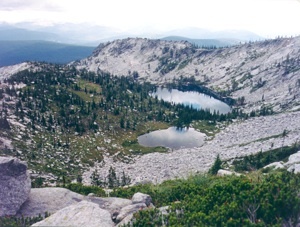 Square Mountain RNA is situated in the center of the Gospel – Hump Wilderness at an elevation of 6,960 feet. The narrow, deep inlet to the lake contains small size pea gravel as a substrate. The relatively wide shallow outlet has a bottom substrate of coarse particulate organic material in contrast to the inlet’s mineral substrate. The outlet is also much warmer than the inlet. The most obvious difference in community structure of the two streams is the greater diversity of stoneflies and caddisflies in the inlet stream. The lake has a maximum depth of 17 feet, an extensive littoral or shallow zone and low alkalinity (ultra-soft water). The entire area burned in 1919, and partially burned again in 1933. Tree cover is minimal over much of the RNA due to fire and a lack of adequate soil development. Whitebark pine-subalpine fir habitat types are found here together with six subalpine fir types. Douglasia idahoensis, a Category 2 candidate, and Forest Service Sensitive Species, occurs along the southwest boundary. Grave Peak RNA is situated on the northern boundary of the Selway – Bitterroot Wilderness in the Clearwater Mountains. The RNA is within the granitic Idaho Batholith, uplifted and exposed in the late Tertiary epoch, and later multiple glacial erosion. Coniferous vegetation consists of subalpine fir, whitebark pine, subalpine larch, and Englemann spruce. A 6 acre lake exceeds 16 feet in depth. The lake’s outlet eventually empties into three ponds a short distance downstream. 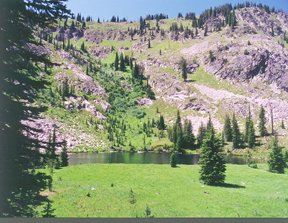 Another shallow pond above the lake, at 7,440 feet elevation, is surrounded by herbaceous vegetation and shrubs. It is fed by melting snow in the talus rock above. A riffle-type stream connects the pond to the lake about 100 feet downstream. It is advisable to spend a couple of days visiting this RNA since access is rather difficult. Warm Springs Creek RNA encompasses a narrow V-shaped valley of Warm Springs Creek at its confluence with Running Creek, both of which have a moderate gradient. The substrate consists mostly of boulders and cobble. Sharp relief occurs here and is responsible for a diverse number of climax associations. Douglas fir habitat type dominate south-facing and west-facing slopes with an overstory of ponderosa pine and an understory of shrubs and graminoids. Mesic grand fir and western red cedar habitat types, often with a Pacific Yew understory, occupy north-facing slopes and along the streams. Two hot springs exist along Warm Springs Creek. Both flow from the top of rocky outcrops and cascade down into the creek. No Business Creek RNA is a tributary of Slate Creek, which is near the Slate Creek Ranger Station off Highway 95. The 1,350 acre RNA consists of a steep forested area in the lower Salmon River country, with elevations ranging from 2,520 – 7,200 feet. Twelve forest-habitat types exist, most of which are dominated by grand fir. Some are in the Douglas fir climax series; others are in the subalpine fir series. Maidenhair fern, western yew, and white alder are rarely encountered at this latitude. The geology is complex and unusual for the region, with calcareous and gneissic rocks present. This may have something to do with the high alkalinity of the stream. The tailed frog requires the cold, clear water that exists in No Business Creek. Moose Meadow Creek RNA is 1000 acres and 9 air miles from the Red River Ranger Station. Elevations range from 6,400 – 7,425 feet. The head of the basin is relatively gentle, with some steep slopes. The stream gradient is moderate and the water clear and cold, winding its way through meadows and a rocky channel. Collectively the wet meadows are very diverse varying from sphagnum bogs to grass and sedge wet meadows. They are located along stream courses but some are positioned on side slopes and ridges. The Pacific giant salamander has been observed in the stream. Forests are dominated by lodgepole pine, subalpine fir, and Englemann spruce. Bog sites support mountain bog gentian, slender bog orchid, and Washington mumulus. 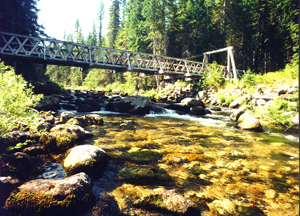 Elk Creek RNA is 7,055 acres and located within the Gospel – Hump Wilderness. It extends from the high-water line of the Salmon River (2,000 feet elevation) to the upper slopes of Elk Creek at 8,371 feet, a difference of 6,371 feet. The easiest access to the RNA is by jet boat. Elk Creek RNA represents a large range of habitat types along a steep south-facing elevational gradient in the Salmon River Canyon. Xeric forests and grassland types are located at the lowest elevations near the river level. An especially good example is mount-mahogany, a bluebunch wheatgrass habitat type. Mid and high regions support ponderosa pine, Douglas fir, grand fir, and subalpine forest types. The RNA also contains a large population of the rare plant, Idaho Douglasia, a Northern Region sensitive species. Newsome Creek RNA is 120 acres and located at the head of Newsome Creek, a major drainage which flows into the South Fork Clearwater River. Elevations range from 4,430 – 5,720 feet, a difference of 1,290 feet. The site was selected as an RNA for its old-growth, climax stands of grand fir, and its understory of Pacific Yew. Small openings of Sitka alder penetrate the dominant grand fir cover type. In addition this RNA attracts moose and provides habitat for pileated woodpeckers, and other wildlife species. Learn about RNA’s managed by the Bureau of Land Management and Idaho Panhandle National Forests that are located in our mission area.